"It's free to use. All you need is a PayPal account to receive payments. We don't take any cut, but note that PayPal may charge a transaction fee." So it seems PayPal is taking the 16% cut Rueleer mentioned. I started my ko-fi page a few months ago, but didn`t get any donations yet. I never had much success with Patreon and then weird stuff started happening and I left it behind, so i think Ko-Fi is a great alternative, and people don't feel obligated as much as they would on Patreon. I have a Ko-Fi account, though I have only had one coffee bout so far, i think it's because i haven't found out to advertise effectively and politely yet. But i will have to work on those skills! Also IDK how everybody else was able to post their button all nice an neat. So I just have a link. I'm not that tech savvy, lol. I just made mine last night. Idk what's up with Patreon, so I haven't made one yet. @UbePie Just like you, i'm not the savviest guy on the block. A friend recommended it to me, just good to have the option ready, I guess. Made one because of this thread. I have seen a few of the links around. I actually wouldn't mind if people donated over patreon, then I wouldn't feel so pressured to offer rewards. Though Patreon seems more stable I suppose since you can see how much you'll be making monthly. I didnt receive any support yet. I have a Ko-Fi but I also use PayPal.me because it is much more flexible in terms of both the amount and the currency. I haven't made Patreon yet, but I am planning to create one in case I start publishing in LINE Webtoon. Thank you for this tip, i didn't know it existed and seem like a way less "forcing" thing on people than to just subscribe monthly to a fee like patreon, i got one patron that is kind enough to pledge to me, i just wish one coffee was a little bit cheaper for people tho (around the 2$ mark) but still it's nice ! 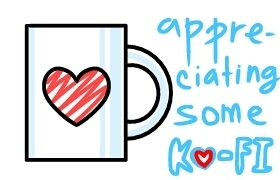 I saw some other artists have Ko-Fi. I've been thinking of getting this, but I'm not sure if it's worth it since I only have 63 subscribers. it's never wrong to try something XD! I really like the idea of ko-fi as it's totally up to the individual to donate. I'm like many and haven't received any yet but it's a great asset for artists. Bumping because I didn't know if we could actually post about our Ko-Fi and/or Patreon stuff here. I'd put mine, but I usually use my Ko-Fi for fan fiction purposes. Still feeling grateful for that. Also, I made a simple banner to put on my works(yet) , but it it okay? I have less than 50 subs, thought. Oh yeah I forgot about this thing sometimes! !